Dubai’s ACO facility ... customised products ready for delivery. Drainage systems from ACO have been put to good use in commercial, residential, infrastructural and residential projects across the Gulf. ACO Group, a global leader in drainage systems, offers region-specific solutions that cater to the complex drainage requirements posed by the extreme weather and environmental conditions of the Gulf. And all these solutions are produced at its facility in Dubai, UAE. ACO in Dubai manufactures different types of kitchen drainage solutions such as modular channels with ladder or mesh grating, tray channels with gratings and floor drains and gullies in stainless steel. It also produces shower channels with different design gratings and floor drains in stainless steel to provide bathroom drainage solutions. “To cover the Middle East market and to avoid long delivery times, and to save clients logistic costs, we are manufacturing commercial kitchen drainage channels, shower channels, floor drains and external drainage products in stainless steel in Dubai according the European Norms and ACO standards,” says a spokesman for ACO Systems. “ACO Systems can produce and deliver to all GCC countries and also to the Mena countries, South Asia and East Africa,” he adds. According to the spokesman, the increasingly extreme weather conditions must be tackled with more complex and sophisticated drainage concepts; ACO achieves this with intelligent system solutions that have a dual purpose: protecting people from water, and water from people. “Every ACO product within its system chain safely controls the water as it passes along the chain to ensure that it can be ecologically and economically reused in a viable way,” he says. ACO is also focused on establishing grease and oil separator technology in the region. It manufactures special separation products in Germany and other European countries based on this technology. ACO Group is a specialist in the manufacture and supply of corrosion-resistant polymer concrete and stainless steel drainage systems for external and internal applications. With more than 40 years of experience in the removal and containment of waste water, ACO has recently entered the field of wastewater management with systems for the treatment and reuse of gray water. The group entered the Middle East market some 25 years ago. In 2006, ACO opened an office and warehouse to establish its products in the region, and then created a separate company called ACO Systems, located in Dubai’s Jebel Ali Free Zone. 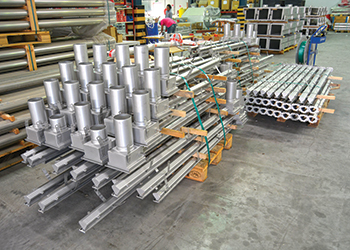 In 2010, ACO Systems built a manufacturing facility to produce stainless steel products especially for the Middle East market. ACO Systems has served numerous projects since 2011 with various drainage systems, covering commercial and infrastructure, residential and industrial developments. This has entailed cooperation with a wide range of main contractors. Most of its prestigious projects are in Saudi Arabia. These include the Grand Mosque expansion in Makkah where ACO supplied various building drainage systems; King Abdullah Sports City in Jeddah, King Abdullah Financial District in Riyadh and King Faisal University in Al Hasa, where the company provided internal and external drainage systems; King Abdul Aziz Centre for World Culture in Al Khobar and Princess Nora University in Riyadh where it supplied external drainage systems; and King Saud University in Riyadh, where its sport system has been installed. In Qatar, ACO Systems has contributed to infrastructure projects such as the Muntazah and Dukhan highway projects and several building projects including hotels, commercial kitchens and metro stations. In the UAE, ACO has supplied to internal and external drainage systems for mega projects such as the Burj Al Arab, Burj Khalifa, Dubai Mall, Mall of the Emirates and other main shopping centres, Palm Jumeirah, Yas and Saadiyat islands, Maritime City, Dubai Airport, Abu Dhabi Airport, Khalifa Port, and Emirates catering kitchen, in addition to several hotel and tower projects like the Conrad Hotel, Four Seasons Jumeirah, Rosewood Hotel and Emirates Palace hotel. ACO has also supplied many infrastructure projects with different products such as bridge drains, road and highway line drainage solutions, manhole covers and multipart covers. In all other GCC and Mena countries, ACO has supplied to major projects including Cairo Airport, American College in Beirut, the Grand Mosque and the new Opera House in Oman, a bridge in Bahrain, and many more.